Three-time Super Bowl champion. Three-time Boston Marathon finisher. 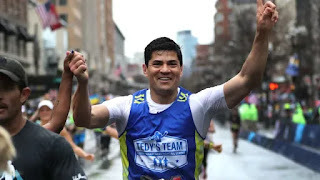 Current ESPN NFL analyst and former New England Patriots linebacker, Tedy Bruschi, finished the 2019 Boston Marathon on Monday in a time on 4:35:35. Bruschi ran the race back in 2012, 2014 and again this year, along with members from his non-profit organization, Tedy’s Team. He and his wife partnered together with the American Stroke Association after Bruschi’s stroke in Feb. 2005. Tedy’s Team runs the Boston Marathon, Falmouth Road Race and others each year to raise awareness on stroke and heart-disease research. Check out the videos below from WBZ-TV to see the moment Bruschi finishes the race!